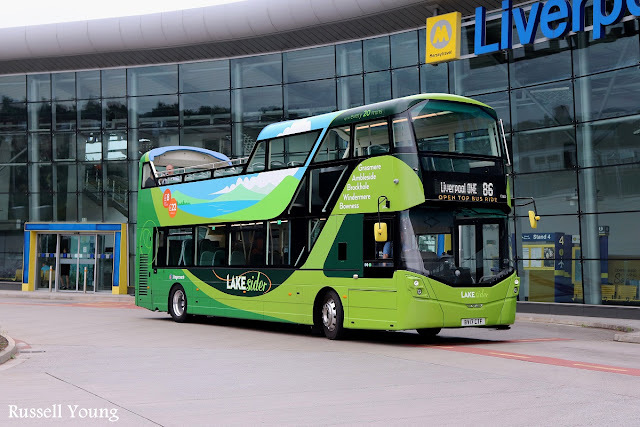 Intelligent Transport System (ITS), which alters signal timings to prioritise buses that are running late will first be introduced along the 86 and 86A bus routes – two of the Liverpool City Region's busiest, running between Liverpool city centre, Garston, Liverpool South Parkway, Smithdown Road and Liverpool John Lennon Airport. During 2017 Stagecoach operated one of their then new Wright bodied open-top Volvo B5L over three days in normal city service to promote the LAKEsrider network and the new buses for the route 599 (Grasmere & Bowness-on-Windermere). 13802 is seen here at the John Lennon Airport terminus of route 86 on the 25th July. The ITS project, which is being delivered through the Bus Alliance and Liverpool City Council on behalf of the Liverpool City Region Combined Authority, is being financed through Local Growth Fund (LGF). LGF funding is awarded to the Liverpool City Region Local Enterprise Partnership (LEP) and invested through the Liverpool City Region Combined Authority's Strategic Investment Fund. The technology uses Merseytravel's existing Real Time Information (RTI) data to identify if a bus is late. Using this method will avoid the cost of fitting additional equipment to vehicles or the disruption of digging up roads to install fixed detectors. It also uses existing capabilities in Liverpool's traffic signal control system. "We're committed to boosting economic growth across the whole of the Northern Powerhouse and building a Britain fit for the future. "The Local Growth Fund is enabling passengers on two of Liverpool's busiest bus routes to experience quicker and more environmentally friendly journeys by providing state-of-the-art traffic signals which alter their timings to prioritise late running buses." "Buses are the backbone of our public transport system and we are determined to ensure that we can deliver the service that the people of our city region deserve. That is why we are constantly looking for ways to improve and this new development should improve both reliability and punctuality." "We know that punctual and reliable services are key to keeping existing bus users satisfied and in attracting potential new users. Making journeys more efficient and giving more people the confidence to try the bus is also a double whammy in helping improve air quality. "The Liverpool City Region's Bus Alliance will continue to work with the local authorities and other partners to innovate and take a fresh look at challenges." "We pride ourselves on the quality of services we offer across the Liverpool City Region and beyond. Giving passengers the best and most efficient services possible while travelling with us has long been one of our main priorities, which is why we are constantly looking for ways to improve what we do. This exciting new development will allow us to improve the punctuality of our buses, which can often be impacted by external factors such as congestion, and help to further improve our passengers' journey."